Though these ground-dwellers are shy around humans, you might notice them more and more once spring hits and plants sprout. As cute as they may seem, groundhogs can cause massive amounts of damage to yards and gardens, so it's important to kick them out as soon as possible. But how, exactly, can you kick them to the curb? Our info-packed guide has the scoop. Keep reading for all the tips and tricks you need for a groundhog-free yard! First Things First: Is It a Groundhog? Will a Groundhog Destroy my Yard? Where Will I Find a Groundhog? Groundhogs vs. Pets: Should I Be Worried? In a word, yes. These animals can be called by either name, and are sometimes even referred to as "whistle pigs" because of the whistling sound they make to one another. Groundhogs are mammals and herbivores, which means they only eat plants. They belong to a group of animals called marmots, which are basically giant ground squirrels. Woodchucks can be identified first thing by their prominent teeth and round, heavy bodies covered in brown hair. Most weigh between 10 and 13 lbs. and avoid contact with humans as much as possible. Read Also: How do you inspect your property and identify a groundhog? Since groundhogs are herbivores, they really like fruits, vegetables, and foliage like dandelions. Vegetable gardens provide a ton of food sources for woodchucks, so these green spaces are often a prime target. It's not uncommon for groundhogs to munch on homegrown veggies. For a detailed description of these little guys (and to see them in action), check out the video below. They will also eat nuts and roots, and the occasional insect if they really need food. The reason these animals seem to inhale food like a vacuum cleaner is that, like bears, groundhogs spend half the year in hibernation. The groundhog will eat for about six months straight, then spend the frozen winter months fast asleep below ground, emerging once again in the springtime. As a species, groundhogs can be found all throughout North America. Groundhogs dig elaborate burrows for themselves which range in size from 8 to 66 ft. and frequently have up to 5 or 6 entrances. The animal digs a separate chamber to use as a bathroom and typically lives alone unless it has a litter of kits. Because these burrows have so many entrances (and normally a few exits above ground), it's not uncommon for your yard to be littered with holes due to the burrowing habits of resident woodchucks. This is often the first sign that you've got one of these little guys living on your property! Most woodchucks avoid humans and other animals, but can bite an attacker when threatened. If a pet is bitten, there is a small chance it could contract a disease like rabies, but this is rare. Any bites should be treated and the animal should be taken to a vet for a full checkup. Here's the thing: there are a few different ways to get groundhogs out of your yard. Some are more intensive than others, while a few of the methods require little more legwork. Some are preventative, while some should only be used once you know you have a woodchuck problem. It should also be noted that certain states have laws government the treatment toward groundhogs, so it's important that you check in with your local Fish and Wildlife division before making a decision about how to proceed with taking care of your groundhog problem in the yard. If none of these seem to work for you, you can always contact a professional pest control company to help you. Most of these traps look like cages which have a door that swings shut via a spring once an animal activates it from the inside. You can catch a groundhog by putting a bait inside and waiting for the animal to go after it. Most live traps cost around $50 and have special outer handles so you can take the captured groundhog to a wildlife center or shelter for safe release. Sometimes woodchucks will roll the cage to break free, so be sure to put something heavy like a brick on top. If you're worried about one of these guys chewing through the bars, pick a trap with a strong, thick wire mesh. Read Also: How to pick a good groundhog bait for trapping? Repellents for nuisance animals are products made from ingredients which typically irritate a groundhog's eyes or nose. Many of these products contain natural active ingredients such as pepper or other spices. Repellents are normally sold in granule form or as liquids, and are applied differently depending on their consistency. For example, you apply granules in a barrier around your plants to stop a woodchuck from reaching them. Liquid repellents, in contrast, are sprayed on plants and can be rinsed off later if you want to eat the affected produce. These are small devices placed throughout a garden that will spray water like a sprinkler. These repellents are motion-activated and will douse a groundhog when it gets to close to your peas and carrots. Reflexively, when the groundhog is sprinkled with water, it will become startled and run the other direction. These devices are preferred among gardeners because not only are they humane and non-harmful to the groundhog in question, but they work to water the plants at the same time! The user can, of course, control the settings and how strong the blast is. Even though groundhogs dig, they can be deterred by fencing which doesn't allow access to the topside of your yard. If woodchucks are a serious problem but you are not comfortable trapping or killing them, you can install a chain link fence, or a barrier made from other materials. This small deterrent can often be enough to prevent future pest problems, and even pests of other species. It's possible to purchase products known as rodent gassers or fumigants online. These can be placed in the holes leading to a groundhog's burrow and will either drive the animal away, or kill it. Most gassers are toxic and not reusable. If you choose to use a gasser, read all of the attached instructions and check the laws in your states—some places have rules about when and where nuisance animals like groundhogs and raccoons can be killed. Having a groundhog doesn't have to be the end of your garden. When you notice the nibbles here and there of phantom teeth, it's time to take action—sooner rather than later. 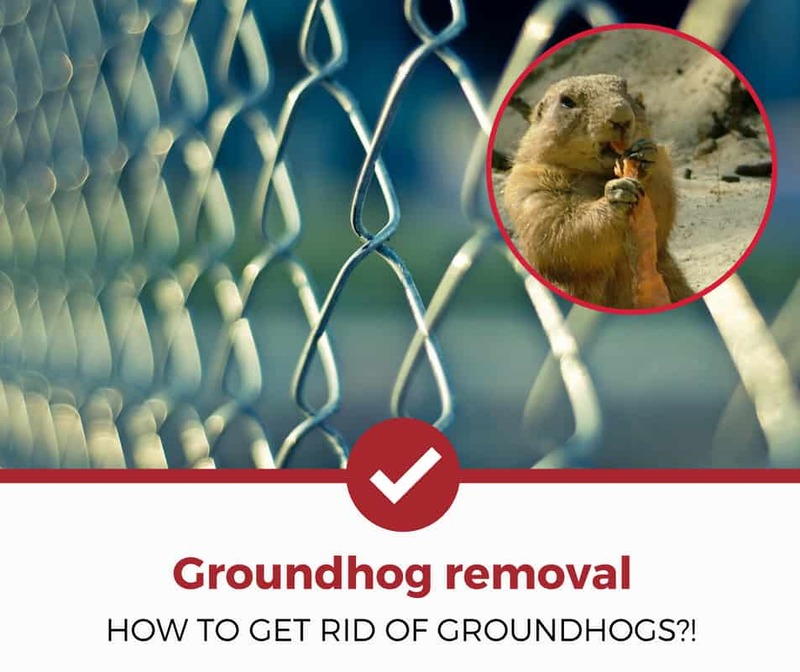 If you are having trouble with an unwanted guest burrowing beneath your property and ransacking your garden, take some of the above steps to clear out your yard. Your garden will thank you for it!